Colles' Fracture fracture = extra-articular fracture of the distal radius that does not extend into the joint. Mechanism of injury = fall on an outstretched and dorsiflexed hand. Colles' fractures = 90% of distal radius fractures. Pain and swelling in wrist. Generally have gross deformity to the wrist with dorsal and lateral displacement, "dinner fork" deformity. PA, Lateral wrist films. Normal radiographic parameters: Radial inclination=23°,radial length=12mm, volar tilt=11°, scapholunate angle = 60° +/-15°. 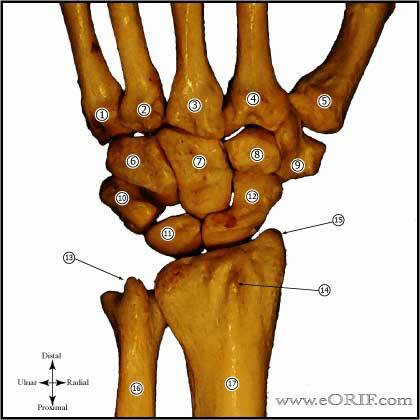 Assess ulnar variance, carpal alignment and sigmoid notch conguence. Chauffeur' Fracture's fracture = intraarticular fracture of the base of the radial styloid. Used to occur then cars backfired while they were being crank started. 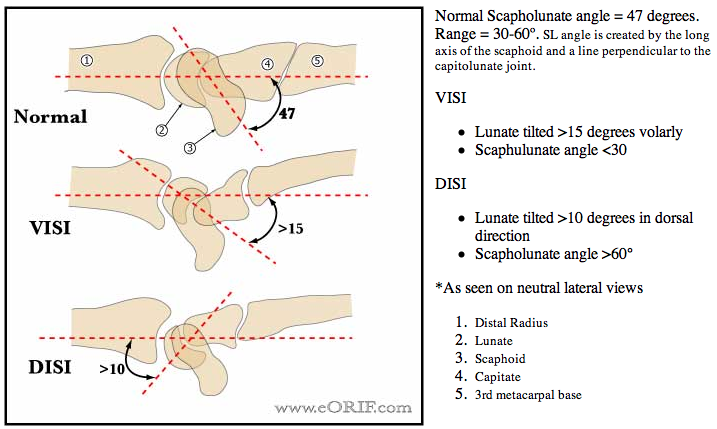 Scapholunate ligament tear: occurs in @12%.